DVDVob2Mpg is a simple, free, straightforward and very fast VOB (or VRO) file to MPG converter. Contrary to popular belief, VOB and VRO files are not the same as MPG files. VOB and VRO files contain the MPEG, but also various other data, and headers may be incomplete or wrong etc. Because of that, VOB and VRO files typically don’t play well using media Players (for instance Windows Media Player). Some DVD Video Playback software is able to get past that, but not always, especially when the relevant IFO files are not available. 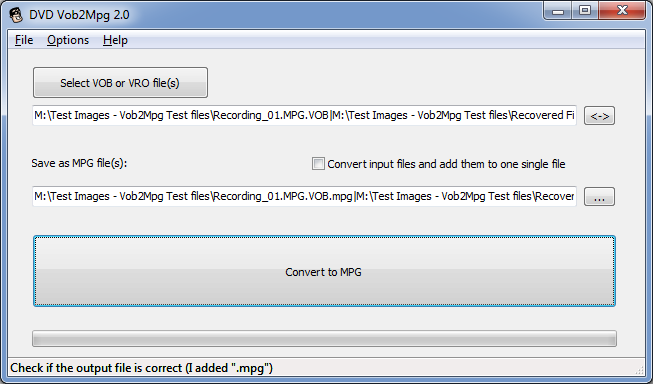 DVDVob2Mpg fixes the MPEG stream and converts your VOB/VRO files to MPG files with ease. DVDVob2Mpg is very fast and causes no loss of quality ! It does not re-encode the video and audio like so many other applications do. Instead it re-multiplexes the existing video and audio while it fixes the MPEG program stream and headers, it calculates and applies correct timing, throws away bad video frames and nonsense data. At the end everything is puzzled back together to come to a very clean MPG file, per the MPEG standard. MPG files created with DVDVob2Mpg will play beautifully using Windows media player, and they will import with ease in all Video DVD authoring applications or Video Editing software. DVDVob2Mpg is free. I make my income from IsoBuster. If you like DVDVob2Mpg, check out IsoBuster. Knowing about IsoBuster may come in handy one day. with an immdeiate start and auto close when done…. I’ve found this to be an excellent program to produce very clean .MPG files. BATCH PROCESSING akin to what another poster has already requested would be extremely useful. I’m staring at over 10 years worth of DVD rips and more than 2,000 files to convert. Great initial release! Looking forward to more! Wow! Sincerely, thank you so much! It has really encoded my VRO file to MPEG! Thank you. because you could potentially do this with one line as well now. Thanks for making the new beta version available so quickly! The only other minor recommendations left that I can think of would be drag and drop support and a native 64-bit executable (unsure if that would actually improve the rendering time or not; ie unnecessary). DVDVob2Mpg converts my.VOB files to mpg but as a separate file for each .VOB file. Do I need the pro version to be able to create a single mpg file from all the .VOBs? Also, can it be used to join existing mpg files together? PS. I should make it a final version. There are no known issues with this version. I just haven’t gotten to releasing the final version yet. It’s not designed to join mpg files now, because mpg files by itself come in many flavors. You then better try a video editor that understands many video formats. The transfer only converts audio from the VOB file. Please check this Tim: http://www.dvdvobtompg.com/mpg-files-dont-play-on-windows-8/ and thanks for letting me know ! Goodbye VOB2MPG, hello DVDVob2Mpg! Good job. I like the option to join several VOBs to one MPG. Thanks. Thanks for adding the ability to merge several VOB files into one MPG file. As Wayne mentions, “goodbye VOB2MPG” (which I could never get to work with Windows 8). The only problem I saw was the progress bar seems to finish early when merging many VOB files. If I process 6-7 VOB files into one MPG, the green progress bar finishes in the middle of the forth VOB file. The processing continues, so in the end I get the complete MPG file, it’s just the progress bar finishes too soon. But that’s a nit. Great job. I’ll look into it when I find a moment !! ESET is more a pest than the pests it claims to find. I’m so tired of the false positives, because that’s what they are. hmm, this looks great!, but is this virusfree, adwarefree, spamfree, etc? does it install other software like toolbars etc? in other words, is this really clean and freeware? i’ve seen so many vob2mpg programs that are ‘free’ . I liked this software very much… Exactly what I wanted: processing without reencode. However, at least in my machine (Windows 7 64 bit) there’s a strange issue. Avast free anti-virus won’t let me open the installation .exe, so I turned the anti-virus off. Later, with DVDVob2Mpg installed and the anti-virus running again, now the Avast wouldn’t let me run the installed program. Funny is that I had Avast checking the installation .exe and the result was “no virus found”… So hard to understand this. Avast should get off DVDVob2Mpg’s back! Thanks! Avast is another one that always sits at the back of the class. More of pest itself. I think I’d rather install a Trojan than Avast. Avast uses a database of sorts in the cloud, and if the program is not in there or hasn’t been scored enough (or something like that) it is automatically suspicious. I suppose that saves them from doing the hard work and actually figure out if a program is infected or malware. Btw. all people with beards are terrorists ! Just so that you know. PS. Everybody. For whatever reason I’m not getting the emails when somebody posts something here. So sometimes it takes a while before I notice the new posts and before I respond. You’re always welcome to prod me. Cheers. Hi, can DVDVob2Mpg recognize title and converts to seperate MPG files? No, it simply converts VOB files, it does not interpret IFO files etc. Installed on Windows 8.1 Pro. When I select the vro file and click on Convert to MPG it displays a processing message and just sets there. Any suggestions? Not sure. It works fine on Windows 8.1 here. So, I’m having the opposite problem of many people. The video plays, but there’s no audio. Any thoughts? Does dvdvob2mpg not fix the issue ? Is this used on DVDs that are played on stand alone DVD players? or is this for computer files only? ?I bought isobuster and I hope to learn how to use it someday, still trying. Works a treat! Was able to fix what MakeMKV could not. Thank you very much! Great. Good to hear Steve. Hi, was wondering if there was a guide to what the options do. I imagine I don’t need everything checked but don’t know what all those options are. Good point Ian. I have not documented that yet. I would keep everything checked ! Audio is sometimes encoded in a private stream. For normal use, keep everything checked. If you’re an mpeg specialist and you know what these different parts mean, you can experiment with the options. Personally I keep everything checked ! I used a Sony VHS to DVD machine to transfer all my home videos to dvd. I’ve found that I cannot copy these dvds now. I wanted to be able to import my home videos into Final Cut Pro to edit into special remixes of various parts of different discs. In other words, maybe I want to make a video for one of my children that include all his birthdays into one disc. However, I’m having difficulty working with getting them copied onto my pc. Your program worked, but only up until the last vob file. I kept getting a message that said the file or directory is corrupted and unreadable. Do you have any idea why your program can’t access this last vob file? Any suggestions? Something I’m doing wrong? Why would just the last file be corrupted and unreadable? It seems that that VOB file is unreadable by Windows ? DVDVob2Mpg uses Windows file IO to get to the file and convert it. Best try IsoBuster to recover the VOB file then. Have you tried playing the file with VLC ? Yes have tried watching with VLC but I get the same result. Love your programme, simplicity is great, oh and it works too !! I have loads of pop videos extracted from DVD’s over the years as individual VOB files. Is it possible to have a batch convert box where you could simply enter the folder you want to point the programme at, and it would then convert all vob files it found in that folder ? Keep up the good work and thank you for making free to all. My VOB files are converted to MPG files and the video plays back in full; however, the audio is completely distorted. I am using Windows Media Player on Windows 7. Any ideas? I just tried Iso Buster Pro (using ‘Extract but filter only MPEG video frames’) and I get the same distorted audio. NOTE: The IsoBuster also takes longer and it seems as if it also tries to convert the *.BUP & *.IFO files to MPG. In other words, I was expecting a one-for-one number of files between the DVD’s *.VOB files and the converted *.MPG files; however, there were lots more *.MPG files. Try VLC (free media player) and see if the problem persists. also check if there are more than 1 audio channels, maybe another one has the correct data ? There are no words to thank you for this application. I use to use the “other” vob2mpg and it worked OK but slow as molasses, but now on Windows 10 it just does not work at all. Your program works perfectly under Win 10 in order to stitch all VOB’s of a ripped movie together into a single MPG. If there’s anything to complain about, is that the progress bar is not accurate as it fills up before the last VOB on a set is finished processing… which is absolutely trivial and would just be icing on the cake. Thank you, thank you very much for making this little handy app! Hi, Thank you very much for this program! I love the “join files option” this allowed me to backup very old footage from DVDR cam after years rotting on my HDD. I can finally BLURAY backup all of the files. I would love to see option to then join other converted files together making it ultimate tool too release older files into the wild please dont stop, such simplicity what will save humanity one day. Thanks. The intent of joining files is to join MPEG from the same source, with same encoding and bitrate etc. So that split VOB files can be joined into one bigger MPG file. Joining together all sorts of other formats opens a big can of worms, requires knowledge of all those file formats inside-out, requires re-encoding the video and is really not the intent of this little app. Glad you like it ! This program is wonderful! The only problem I’ve encountered is that on some jobs the resulting MPG features the wrong audio stream. For instance, it might produce an MPG with French dubbed audio, or it might have director’s commentary. Both audio streams should still be present !? Can you not select which one to play via the player’s settings ? I guess for my purposes if you had a control on the GUI, as well as a flag for the command line, that allowed for the specification of which audio streams should be included in the resulting .mpg, that would be awesome. I guess I would like there to be only one audio stream so that there is no need to fuss with that. I use Plex but I don’t want other users in my household to be challenged with switching audio streams. And I’m not sure that the Plex client on Android allows for switching audio streams. I have a Panasonic DVD Ram with recordings done with a DVD recorder. The videos are VRO. I have read that I could convert these using VLC Player but it did not work for me. Will this software convert to a format which I can edit as well as share on Facebook for example? Is it possible to take the chapters from vob (DVD Rip) to mpg file? Hi, No it simply converts the entire video stream. If you want to break it up in pieces you need a video editor. When I convert the VOB to mpg it comes as an audio file that plays a black screen in Windows Media Player and Movie Maker. Any suggestions? Thanks for your time. Strange. Does the file play OK with VLC ? Have you checked this: http://www.dvdvobtompg.com/mpg-files-dont-play-on-windows-8/ It may be the reason ! Seems to be working but also has been converting for over 5 hours now…is this normal? The .VOB file is just a tad over 1,000,000KB (yes KB). Thanks! That doesn’t seem normal no. Basically your file is under 1 GB? It should take minutes rather than hours. The converted VOB files aren’t playing in Movie Maker or media player? On Windows 8 or 10 but no problem on Windows 7 (for instance) ? I like your programme. It works fine on Windows 10. I tried to convert some DVD´s to MPEG with Pinnacle 12. It has a “Import DVD Titles” function which is very convenient, because it reads from the DVD-player and separates titles and make separate MPG files. However a video which should be 29.37 min ended up being 30.15 min and with several less than a second long stops ( picture and sound freezes) about every 2-3 min, making it unusable. I then tried your program converting VOB files directly from the DVD, and the file ended up being exactly the 29.37 min. it should be and no annoying small stops. Selecting the above should then become two MPG files eg. “title1.mpg” and “title2.mpg”. It means a “join title files” option similar to “join files”. Or maybe an option that automatically selected all VOB on a DVD ( not the menu) and then two options: make one file, or make titles. Thank you for the good work and making it free. Thank you John. Unless I misunderstand what you ask is the simple task of running the program twice or more, correct ? First for the first 2 VOBs, next for the following 2 VOBs and so on ? I won’t be implementing that, sorry 🙂 Focus is on other things I’m afraid. Peter, I realize this is an old post I’m replying to, but I think the point John was making is that there isn’t an easy way to KNOW which vob files on a dvd are part of title 1 or 2 or whatever. So it would be nice if the software could split the mpg files for separate titles. I realize bases on other comments you have made that this software isn’t able to read the ifo files etc to determine this information and do this, so clearly this is not an option. But the point I think his issue is that HE wouldn’t know which vob files to include as being joined, because the vob files don’t usually actually TELL YOU which title they are part of, he was only using that wording to explain what he wanted to do. When I look at a dvd, without a lot of trial and error, how do I know which vob files to JOIN if I want to end up with separate mpg files for each title, that is the point. I see your point but indeed I’m afraid I can’t help there. DVDVob2Mpg really just cleans up the mpeg stream(s) and aside from that there is indeed no way of knowing anyway (that I know of) based on the VOB files alone. You could try http://www.isobuster.com ? It does a pretty good job identifying recordings on both DVD-R and DVD+R. It reads information from the IFO files as well. You could extract the different recordings that way ? Thank you so much Peter. Works perfectly. This solved all my problems. Thank you for developing such a powerful, yet simple tool, and sharing it with everyone. I wanted to use your program to convert VROs of VHS-Recordings I digitised on a Panasonic HDD Recorder. Unfortunately it seems to be unable to cope with the 33 GB files I have from recording 8h Longplay VHS-Cassettes in Extra-Quality-Mode (XP) and PCM Audio. The first thing to notice is that the progress bar reaches 100% long before the actual end of the conversion. The Resulting MPG will start playing but seeking is impossible. Also the exactly 8h long Recording will show up as 07:30:26 in VLC, as 21:15:22 in MediaPlayerClassic and as no duration at all in Windows File properties. Could it be that those big files role over some too small data types in your program? Smaller Files work without a problem. It would surprise me but I have to check ad I can’t do it right now. It’s possible to create a MPG file with one of the subtitles of the original DVD? I can’t help you with that I’m afraid. That’s more a Video DVD / mpeg editor kind a thing. I work at a company that specializes in transferring old media to DVD and MP4 files. I was recently given a large set of DVD discs that were recorded on a DVD recording camera. I believe many of the discs were not finalized, but finally found one that would load on my PC. But no programs have been able to load the VRO file on the disc, unfortunately including DVDVOB2PMG. It just hangs saying that it’s processing the file, but nothing happens on the progress bar. Any idea what may be going wrong? Have you tried http://www.isobuster.com ? I think the disc quality has degraded to a point where the data is hard (or impossible) to read. My best advice is to try a few more drives because not all drives behave the same on troublesome media and some may still be able to read what your current drive cannot. Spettacolare, davvero un ottimo programma. Copyright 2015 DVDVob2Mpg. All rights reserved. Website by WebKrunch.